Marble bathroom worktops – built with the best quality natural stone – have that luxury look and feel that really weathers the years. From offices to kitchens and floors throughout the home, Pure Quartz have the experts, tools and supplies to ensure that you get the best out of installing marble bathroom worktops. We will work closely with you through a range of ideas and designs to ensure that we complement your existing décor as well as your personality and sense of style. From white marble bathroom worktops to cultured marble bathroom worktops , we work with the likes of Compac, Classic Quartz, Unistone, Cimstone and more to make sure that you get the best quality stone and fitting for your dream project. Silestone worktop and stone countertops for kitchens and bathrooms are our speciality – and when it comes to great-looking natural marble, we have a flair and an eye for knowing exactly where it will look the best. We’re more than just your local marble bathroom suppliers – we’ll work closely with you throughout your project and will advise you on the best possible choices available for your custom stone countertop requirements. Throughout Bromley, Lambeth and beyond across South East London, Pure Quartz are considered leading professionals and experts when it comes to marble bathroom design and fitting. We are a local, home-grown firm with a ‘near me’ focus – offering you affordable, low cost installation and design support on culture marble bathroom countertops designs. We are a local supplier who cares about transferring the best value deals and savings to you – where there is a discount to be made, we will make sure you receive it. Our top marble bathroom worktops perfectly blend with a wide range of classic and contemporary bathroom installations and designs. That no matter your existing décor or setup, we will be sure to implement the best possible touches for your wet room or bathroom design. 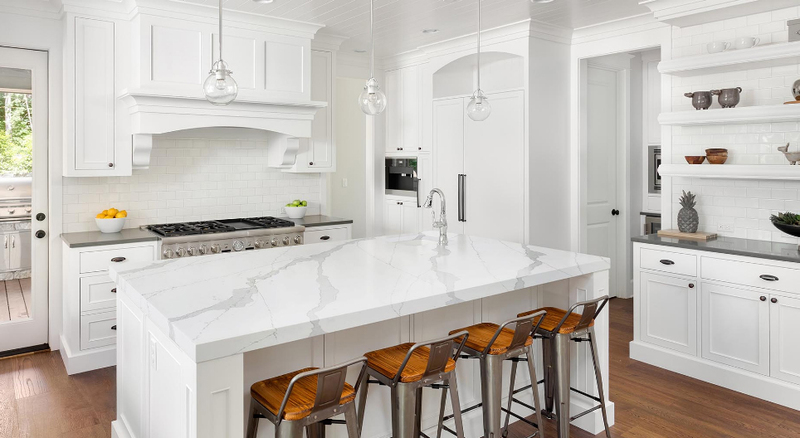 We are a trusted and reliable dealer in marble kitchens, bathrooms and more – working with the likes of Silestone, Caesarstone and Santmargerita to help offer our customers a world of variety and choice from room to room. Why not transform your whole home in new and natural marble? In a range of colours – beyond black and white if you prefer – our luxury fitting and design services will allow you to take advantage of some truly wonderful looks for your bathroom. Marble has that classic edge that still feels modern enough to last the years – and our stone is always provided at the highest possible quality no matter how bespoke your needs may be. For a free quote or to discuss your project with our experts in more detail, call us today on 01233 733111 or email us with details on your needs and desires. Take a look at some of our wonderful projects to see what we can do with natural marble to help bring your new bathroom to life.